For Athletic and Agile Driving Enthusiasts. The 2016 C-Class is sleeker and more elegant than ever. More substantial in size, space and safety, yet more nimble and lighter. From the Star in its grille to the sculpture of its taillamps, it sets the benchmark for luxury sport sedans. With both luxury and sportiness, the C 300 Sedan upholds everything its style promises. 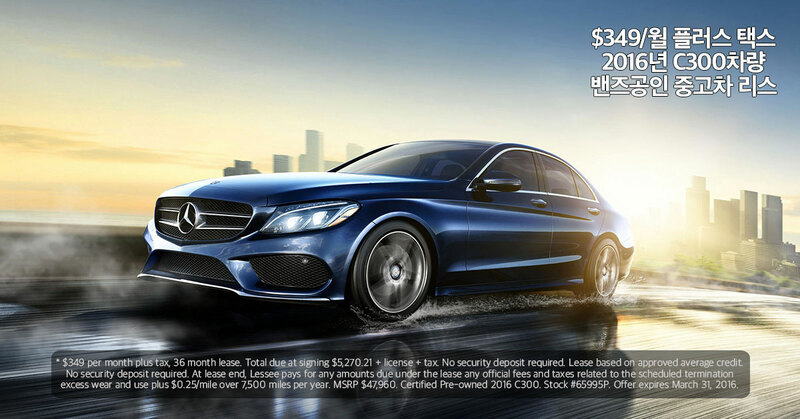 *$349 per month plus tax, 36 month lease. Total due at signing $5,270.21 + license + tax. No security deposit required. Lease based on approved average credit. No security deposit required. At lease end, Lessee pays for any amounts due under the lease any official fees and taxes related to the scheduled termination excess wear and use plus $0.25/mile over 7,500 miles per year. MSRP $47,960. Certified Pre-owned 2016 C 300. Stock #65995P. Offer expires March 31, 2016. Picture above only for display purposes and not an actual advertised car. The most Eye-Catching Style. Work It. 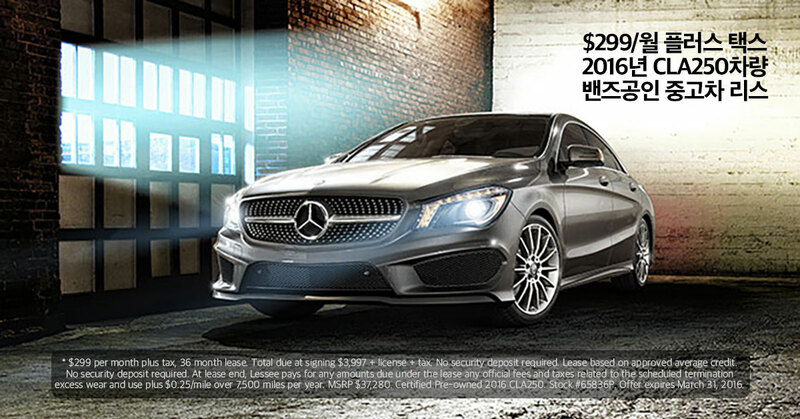 The 2016 CLA Coupe showcases its irresistible sleek profile, as it slices through every street and alley. With its diamond-block grille and LED taillamps, the new Mercedes CLA Coupe couldn’t be more eye-catching for its eye-opening price. But it doesn’t stop there. It’s spacious and sporty interior lets you lay back as you gaze at stars through its panoramic roof. Don’t dream about it, Feel it. *$299 per month plus tax, 36 month lease. Total due at signing $3,997 + license + tax. No security deposit required. Lease based on approved average credit. No security deposit required. At lease end, Lessee pays for any amounts due under the lease any official fees and taxes related to the scheduled termination excess wear and use plus $0.25/mile over 7,500 miles per year. MSRP $37,280. Certified Pre-owned 2016 CLA 250. Stock #65836P. Offer expires March 31, 2016. Picture above only for display purposes and not an actual advertised car. 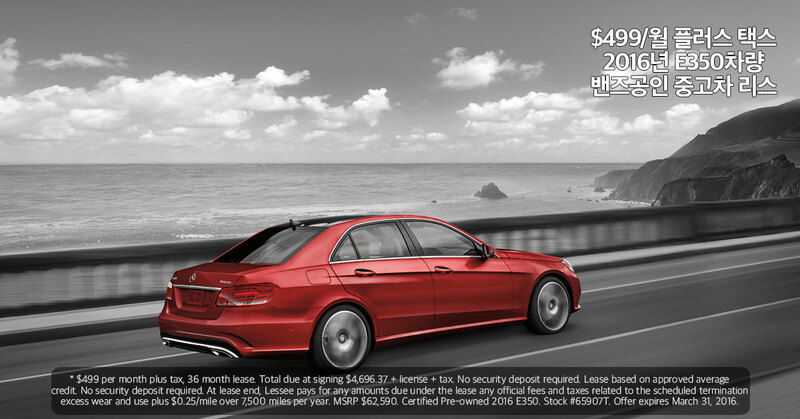 The 2016 E-Class lives to its name. It is a role model to all Mercedes-Benz. With its hand-sculpted physique and wood trimmed interior, it is nothing less of an elegant piece of craftsmanship. You will escape to the feeling of total connectedness as your seat custom-tailors itself to fit you. So, let yourself experience it. *$499 per month plus tax, 36 month lease. Total due at signing $4,696.37 + license + tax. No security deposit required. Lease based on approved average credit. No security deposit required. At lease end, Lessee pays for any amounts due under the lease any official fees and taxes related to the scheduled termination excess wear and use plus $0.25/mile over 7,500 miles per year. MSRP $62,590. Certified Pre-owned 2016 E 350. Stock #65907T. Offer expires March 31, 2016. Picture above only for display purposes and not an actual advertised car. A Class-Leading Innovation for its Age. The 2016 GLA SUV is a true compact luxury Mercedes, with a touch of boldness. Its beefy 18-inch chrome wheels propel you across roads as you lay back in its 14-way adjustable power driver seat. For its size, it delivers a nimble, fun and fuel-efficient luxury experience. Impress yourself. 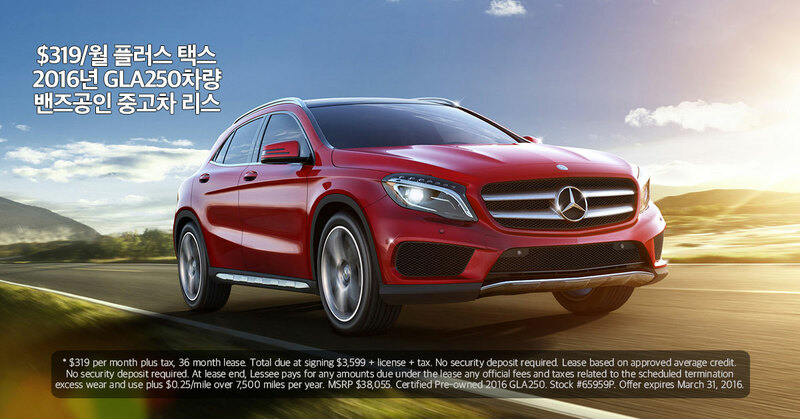 *$319 per month plus tax, 36 month lease. Total due at signing $3,599 + license + tax. No security deposit required. Lease based on approved average credit. No security deposit required. At lease end, Lessee pays for any amounts due under the lease any official fees and taxes related to the scheduled termination excess wear and use plus $0.25/mile over 7,500 miles per year. MSRP $38,055. Certified Pre-owned 2016 GLA 250. Stock #65959P. Offer expires March 31, 2016. Picture above only for display purposes and not an actual advertised car. Born 18 years ago. Today, it’s Reborn. The 2016 GLE SUV is the redesigned and renamed M-Class. Light from its full-LED headlamps and fiber optic LED taillamps encompasses its surrounding. With new advancements built into its muscular physique, its athleticism and sporty spirit is marked from its solid stance. Take hold of your ground. *$550 per month plus tax, 36 month lease. Total due at signing $3,883.45 + license + tax. No security deposit required. Lease based on approved average credit. No security deposit required. At lease end, Lessee pays for any amounts due under the lease any official fees and taxes related to the scheduled termination excess wear and use plus $0.25/mile over 7,500 miles per year. MSRP $56,715. 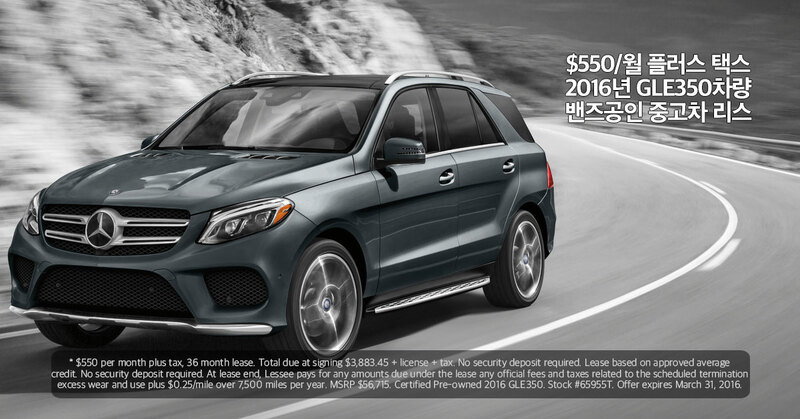 Certified Pre-owned 2016 GLE 350. Stock #65955T. Offer expires March 31, 2016. Picture above only for display purposes and not an actual advertised car.